With the holidays over, the drudgery of the ol' 9-5 routine is back into unremitting overdrive. It's easy to get depressed under piles of overdue filing, banked voice messages & meeting requests that just won't take a breather. Office life can be hell - but it doesn't *have* to be. Take See Jane Work. Have you never visited this office supply website? You are in for a treat! Staples, or Grand & Toy, it is not! It's colourful, whimsical, a one way ticket to a more enjoyable work experience -- just waiting for your custom. Prior to Christmas I was hired to write several holiday shopping wish lists for the fantastically addictive Slice.ca website, and I couldn't help but rave at the time about this cute yet practical Magnetic Birdie. She guards your paper clips, while adding a pleasant touch of colour & joie de vivre to your working week. Remove a clip and birdie exalts with a chirpy tune. Office supplies were never so charming, so...well, happy! 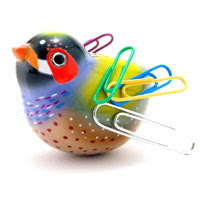 This Magnetic Birdie is just one of many office "necessities" waiting for you at See Jane Work. Check it out... it's well worth a visit even if it's just to give you a midday boost.